One day, as I was researching a raw food diet for my cat, I came across the following site: catinfo.org. While I wasn't ready to go the all raw route (mostly because one of my cats has kidney problems) I found the information on the commercial wet cat food quite interesting. I didn't realize how lacking most of the cat food out there is. Many companies that advertise that they are nourishing our babies are really just giving them some good stuff mixed in with a lot of unnecessary junk. Have you ever tried to read the nutritional information on a cat food label? It's not like human labels, is it? Maximum this. Minimum that. It's confusing. I won't go into all the fun of the cat food label (you can read more about it on catinfo.org if you'd like). I will mention, though, that there is a blatant lack of carbohydrate information. As I've learned, you have to be a bit of a mathematician to figure it out. And after you do figure it out, what then? What's the best way to digest the information? I would suggest looking at the it as the percentages of calories coming from protein, fat, and carbs (the three sources of calories in food). As you can see on the catinfo.org site, she has done a lot of work to provide this information (along with additional info) to us. However, the list hasn't been updated in a very long time and I found most of the percentages out of date. I also found the site cram packed with information, but hard to digest since it's kind of all over the place. Therefore, I have taken some time to update the values and provide the information a bit differently. I have provided the calorie percentages, kcal/oz (so we can compare them across the board), and the moisture maximum %. 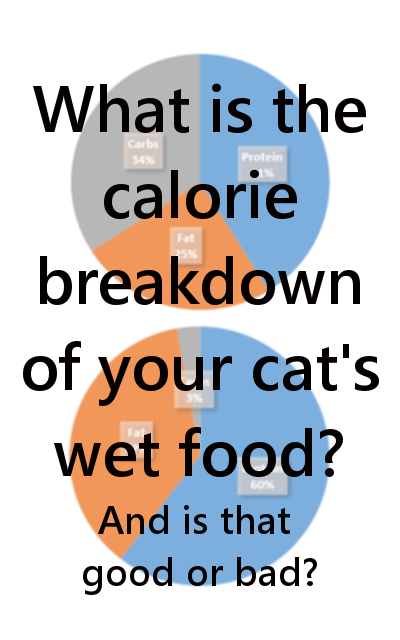 I include the moisture % because of the recommended tips on finding the best food for your cat (below). This is not a complete list of wet cat foods out there. I am still in the process of gathering information from websites. I am starting at brands found at Petco and Petsmart, as they are the most commonly found brands. I will brand out from there after those are complete. Stick to 10% or less carbohydrates. Try to get food higher in protein than in fat. For cost savings, stay at or below 78% moisture. Anything more than that and you're just paying for extra water.